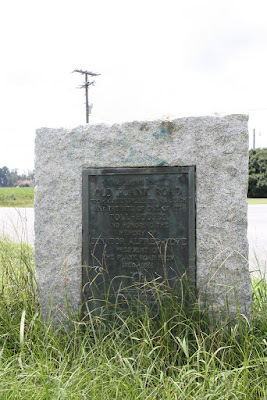 This stone marker just east of Farmville along US 264A marks the location of a former toll booth for the Greenville & Raleigh Plank Road Company. This private company was chartered by the legislature in 1850 and began construction in Greenville the following year. By 1853, the road made it to Wilson but it would go no further. The company would fold in 1861. Plank roads were known as "Farmer's Railroads" as many were built to improve the speed and range of moving tobacco, produce, and other materials quicker and to further markets. The cost to construct plank roads were 1/10th that of a railroad and could be built a lot quicker. The downside was that the planks would deteriorate quickly and maintenance and upkeep would prove to costly for the operators of these wooden toll roads.